Travel with Kevin and Ruth! : Finally, some peace and quiet. We had another busy weekend here at the campground, but it went fairly smoothly. It wasn't sold out, but there weren't many empty sites. Come yesterday evening though, the place feels like a ghost town. And we're okay with that! It's been steadily busy here since about June 30. That's around seven and a half weeks that we've been going pretty much non stop so we're due for a break! We were getting really tired because we weren't going to bed until close to midnight, and getting up usually before 7:00am. I would try and grab a nap in the afternoon most days, but Ruth just kept going. Not sure how she did it, but she's a trooper. So as of this morning, we have a total of 7 sites occupied. A few more still have campers on them but the people have gone home and will return this coming weekend. We might yet have a couple of busy weekends ahead of us, but Monday through Friday should be quiet for the rest of the season. Our empty parking lot yesterday evening. The picture above shows our restaurant building off to the far left. Then the little green shack beside the restaurant is one of three utility sheds. Then you can see our camp pickup truck and the other side of the trees beyond it is our cabin. In the center of the pic is the main restroom and shower building. Oh, and the entire campground is built on the side of a hill and everything is sloped like that. Amazing that some of the campsites are as level as they are! One of our lakefront campsites. Empty sites in the pine grove. I went for a walk around at 10:45pm last night and couldn't believe how quiet it was! Only the sound of my footsteps in the gravel. No wind at all and no camper noise either. Usually there would still be bratty little kids running around! Ha...can you tell we were ready for a break?? 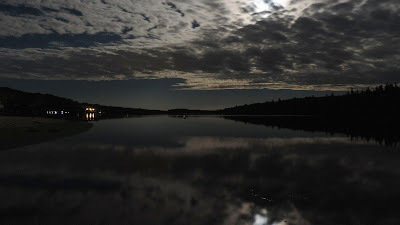 Almost a full moon lighting up the lake at night. And of course Happy Birthday to our favorite daughter Lindsey! 27 years ago today was a pretty exciting day for us! Fingers crossed for more peace and quiet so you can catch up on some of that lost sleep. 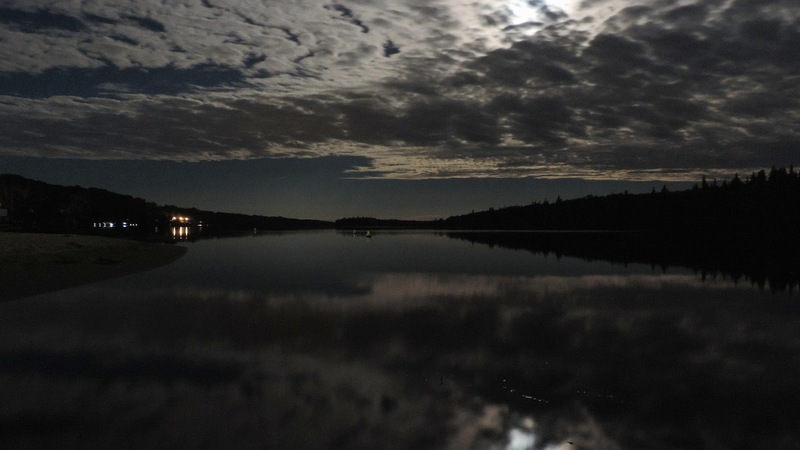 Gorgeous moon and lake picture. 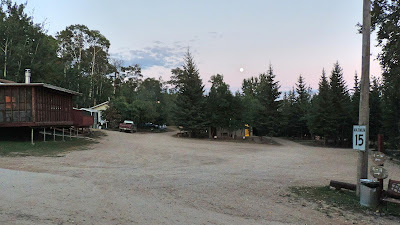 It has been a quiet week here at the campground but I think the weekend will be busy as we are supposed to have more hot weather. sounds like a little bit of heaven! who knew that in Saskatchewan there was such a lovely campground!! We have really enjoyed the week, we sure needed to have a bit of a break. 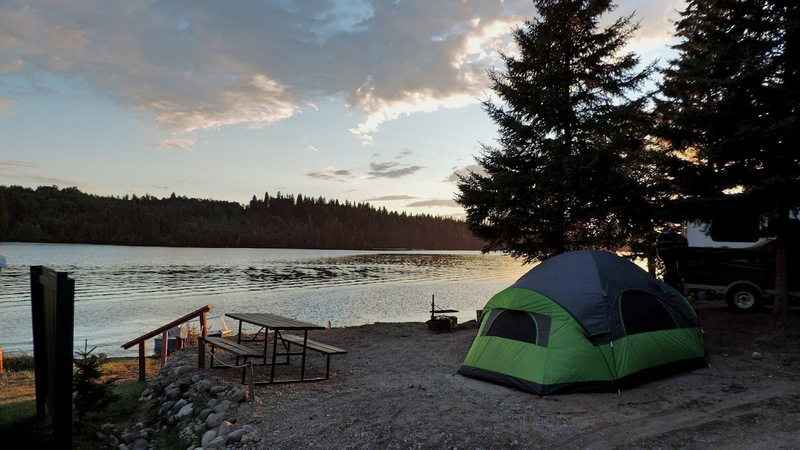 Saskatchewan actually has quite a number of beautiful campgrounds. I think that if people were to take the time to explore Saskatchewan they would be very surprised at what they find here, I know we were. The calm after the storm is always the best. I can see though why the place could be mobbed, some of those lake front spots are really nice. Plus, there's something about camping in amongst the pines that I find really appealing. Maybe you can get to bed before 11:00 tonight? Yes, those lake front spots are beautiful spots to have. The campground is in a really nice setting and we get so many beautiful sunsets at night, Haven't made it down to the lake for a sunrise though, with all this work it sure is hard to get up that early. Enjoy that break, you certainly deserve it! Gorgeous photos Kevin; I can get the FEEL of the campground by your pix and descriptions. Enjoy your "off time," such as it is. I'm in Oregon camped in amongst the trees and loving the shade they provide. We would love to spend more time exploring Oregon, the one time we were there we just drove through it quickly but it looked beautiful and is definitely on our list of places to see. Enjoy your time there Mary-Pat. I enjoyed the tour of your campground. You two have done a wonderful job there. It might of been a lot of work but I'm sure you are proud of the accomplishment. Love the flowers on the tree stump in the pine grove - nice touch! Oh and happy birthday Lindsey! There is still more work to be done but yes, we are happy with what we have done and we have certainly had lots of compliments on how clean it is. The flowers do look pretty there, to they?! how bad are the mosquitoes and black flies? Now, not a problem. In fact, the black flies never were a problem. The mosquitoes were bad in June and July though, no question about it. Some days we couldn't even go outside without putting bug spray on. Now, we see a few in the evening, but nothing to worry about. Now both of you can enjoy the campgrounds!!! Thank you Que Vida and yes, hopefully we can take a canoe out for a paddle again. Thanks Chris. I think I am the "Energizer Bunny", I just keep on going and going! Thanks Kevin and Kim, she told us that she had a great day!